Can you believe that its already time to start thinking of valentines ideas? I’ve been a little stumped with coming up with a unique idea of my own… so I thought I’d share 50 of the best ideas, treats and crafts already out there! Comment below and tell me what your favorite valentines tradition is! 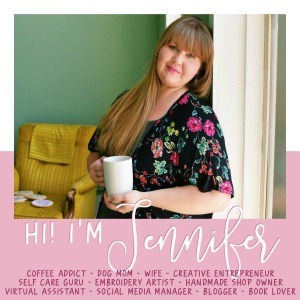 Thank you for including Crafts 'n Coffee, Jennifer. Sharing! Thanks for the round up. Those cupcake look divine!!!!!! What cute ideas. Off to check out a few of them! What an amazing list of Valentine's goodies here. I almost don't even know where to start! This is awesome. Those are some great Valentine's ideas. My kids are off on the actual day from school, so we'll have to do some of them! We have a V-day breakfast and get the girls a fun big gift. Last year we redecorated their entire bathroom. I LOVE Valentines Day roundups because it allows me to access recipes, crafts, and decorations all from one spot. Thanks for putting together such a great roundup! I think I would make the V-Day friendship bracelet cards. Love this list, thank you for sharing. What a great list of crafts and recipes! I've been busy making and sharing some awesome recipes on my blog too. Off to check out these! I could use some Valentine's popcorn right about now!! Last year (for the first time), I made pink Valentine cookies for my son's daycare group. I intend on doing it (or something similar) again this year! Great roundup!!! Thank you for posting! I am always looking for inspiration! These are great! The candle cozies sound fun! Thanks so much for including One Creative Mommy in your roundup! Those cupcakes are so cute!!! The suncatcher is really pretty. The cupcakes are just adorable too! Everything is! These are great! Headed over to pin! Wow, I love these ideas–way too cute, and so beautiful! it makes me want to make some cupcakes! Thanks for all of the valentines ideas – going to pin now! This is an excellent round up! Thanks for all the ideas! What a great list of ideas! I'm doing a roundup sometime next week and I think we have some of the same– Valentine's brings out the cutest ideas! This is such a great roundup! There is so much awesome stuff out there for Valentine's Day! Thanks for including me— This is a great list! These are all awesome ideas!! I've never been one that got too festive for Valentine's Day but these might change that! I need to check this out. I love that Red velvet cup cake and 50 shades of pink. Really wonderful. Thank for sharing.